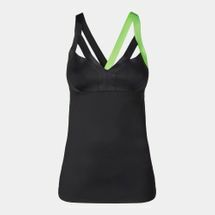 The strappy Reebok C Long Bra Top is perfect for medium impact activities. With built-in bra support for added comfort, it is made from powermesh fabric for breathability with SpeedWick moisture-management technology to help keep you dry. It has a close, stretchy fit with a low neckline.